Oxford University Press is publishing a "book of books" at the start of next year, which has taken an editorial team of 30 seven years to produce. Advance copies of The Oxford Companion to the Book are due to be sent out "shortly", in advance of the 28th January 2010 publication date. OUP described it as "a unique and original work on all aspects of the book from ancient times to the present day". The title was edited by Michael Suarez, professor and director of the Rare Book School at the University of Virginia, and Henry Woudhuysen, professor of English at University College London. OUP editor Joanna Harris said the book was, "not only a unique and ground-breaking reference resource, which we are confident will help to define the growing academic field of book history and bibliography, but also a publication that epitomises- the press' publishing aims as one of the oldest—and largest—university presses in the world". 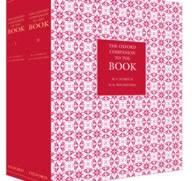 Coleen Hatrick, publicity manager at OUP, added: "Anyone who works in the trade, and all serious book lovers, will want to see The Oxford Companion to the Book. No one has done anything like this before and it will prove enormously useful." The two-volume set, which holds 51 extended essays and 5,160 A–Z entries written by nearly 400 scholars from around the world, is priced at £195, although a pre-publication offer reduces this to £175. Subjects covered by the book include the history of printing, editorial theory and practice, textual criticism, book collecting, libraries, the history of the book, and the electronic book. It also considers the book "around the world".